Bison forward James Wagner has been playing basketball since he was eight years old. Despite interest in a number of other sports as a child, the six-foot-seven freshman is following in his father’s footsteps, and still playing basketball today. Wagner already has championship experience from his time at John Taylor Collegiate. He was a part of the 2014 junior varsity, and 2016 varsity championship teams for the high school. Another impressive part of Wagner’s resume, is that he played for the U18 Canada team at the FIBA America’s Championships in Chile this past summer. He hopes to make this year’s team as well, which will be held in Egypt. 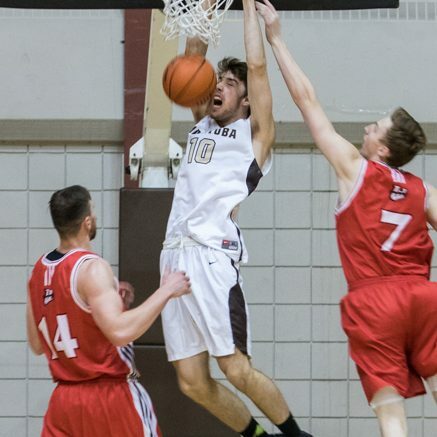 Coming from a team of guys he has played with since grade five, Wagner is now a new face to the veteran-heavy Bisons locker room. They have a few fourth and fifth year players, like captains AJ Basi and Justus Alleyn. Wagner had some recruitment across the country, but decided to stay home and play for his local university. “I had a fair amount of schools across the country, but U of M was just a good fit. I wanted to stay at home, and they have a really good group of guys, it was just a good fit for me,” he said. When Wagner is off the court, he is hitting the books, and looking to get into business at the University of Manitoba. Wagner hasn’t watched as much NBA as of late, but is more interested in the college game. Although he has never filled out a bracket, he enjoys watching the big March Madness tournament unfold and usually cheers for Duke, or the individual players that he follows. If there is any player that Wagner bases his game off of, it is Doug McDermott of the Chicago Bulls. He is not a big name in the NBA, but was a very good player at Creighton University. In just his first year of eligibility, Wagner knows he isn’t going to put up massive numbers, but hopes that he can just do what’s asked of him, and contribute to the team. With the Bisons team having a lot of veterans, Wagner could be that scoring guy and leader for the team for years to come when the opportunity arises.